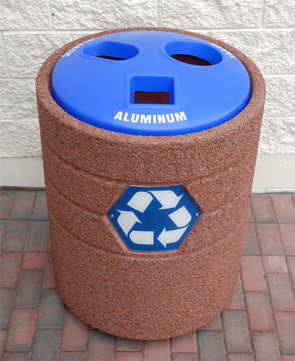 This concrete recycling receptacle is available in Weatherstone, Smooth Stained and Granitex color options or gain some LEED® points with Ground Glass Concrete color and finish options. Concrete Waste Container with Recycling Lid includes 3 separate liners 14 gallons each. Item specific decal labeled openings promotes and emboldens guests to participate in the recycling program. The heavy-duty concrete construction is a natural deterrent to theft and vandalism and requires only minimal maintenance. With several finish and color options to select from, these concrete waste containers with recycling lid are sure to be an enhancement.